My mood is all out of wack today with the rainy gloomy weather. Do any of you find that the weather effects how you feel generally? All of that darkness kind of just creeps under my skin and makes me feel tired and sad. When I am at home for the day relaxing the rain is a nice friend pattering on the windows but as soon as I have to head out into that weather the grogginess sets in! Tell me I'm not totally crazy and you are the same way ;) The great part is that I know just what to do to cheer myself up once I'm home, its warm and comforting macaroni and cheese with a cream of mushroom soup on the dinner menu tonight and burning the last of my bath and body works hot buttered rum candle sounds deliciously enticing! What do you do to cheer yourself up on a gloomy day? Enough about me! Lets talk about the fathers. Fathers day is June 16th. There are two fathers in my life that need some recognition and gratitude for all they do. My father and my husband both work very hard to support their kids and do everything they can to make them happy. Although I am grateful to them every day, I think a day set aside just for fathers is absolutely perfect. If you are still looking for a fathers day gift for that amazing father in your life then you have come to the right place. 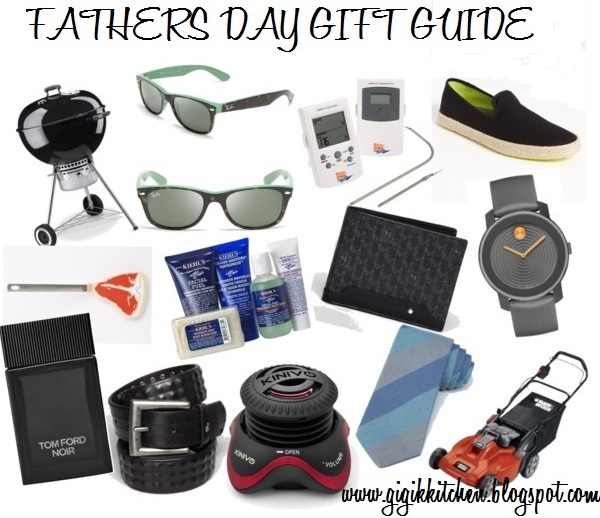 I have gathered my top picks for gifts for Dad. From yard tools to popular electronic gadgets there is something there for everyone. So look no more, because I have fathers day gift ideas you will love and you still have time to make orders online and have them delivered on time with most sites! Hoping you are all having a really lovely Monday! "Every Day May Not Be Good, But There Is Something Good In Every Day!"